Marketing Charts recently reported the results of a new “2011 Social Shopping Study” from the e-tailing group, PowerReviews. The results showed that consumers are spending an increasing amount of their shopping time on the internet researching products and services before purchasing them. According to the data, half (50%) of all consumers spend at least 75% of their total shopping time researching products online. And 15% of all shoppers spend at least 90% of their total shopping time doing online research. Half is more than double the percentage in 2010 when only 21% spent at least 75% of their shopping time conducting online product research. The study also showed that one in three (34%) shoppers spends a few days researching information intensive products before making a purchase. According to the study, search engines were the most popular research starting point with 44% looking to search engines first. Another 33% started their search at the retailer’s website. 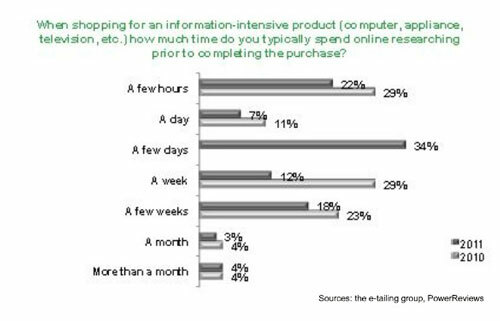 This study shows the increasing importance of the internet in consumer purchasing decisions. The results would also indicate the potential effectiveness of the inbound marketing process (Get Found, Convert, and Analyze) in attracting new customers. Are you using inbound marketing to get new customers? If not, would you like to turn your website into a lead generation machine? If so, contact us today and let us show you how.